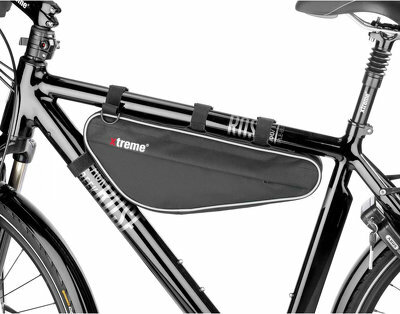 A front triangle bag is a type of frame bag that attaches to the top tube of a bicycle. Unlike a top tube bag it does not sit on top but hangs underneath it. They can be larger and packed with heavier items without the risk of leaning over. Their respective positions mean there's no need to choose; you can have both on your bicycle at once. Since front triangle bag hang below the top tube, they are not as easy to reach into while riding. However, it is still easier than, for example, a saddle bag. It is common to carry tools, a pump and spare tire in this bag, but you can put anything in there that fits. 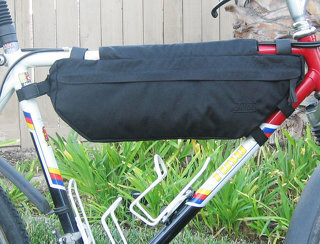 A heavier bag may increase the rubbing of the velcro straps that hold the bag in place; this can eventually wear down the paint on your frame. To prevent this, you can use a frame protector. Unlike other frame bags, a front triangle bag does not usually interfere with bottles mounted inside the front triangle, if it is large enough. One way to get a better indication of how well the bag will fit is by cutting a piece of cardboard to size and see if it fits your frame. However this still involves some guesswork as none of the manufacturers offer a printable template. Measure the length of some of the larger items you want to keep in the bag. Check if the straps of your bag of choice fit around your frame on the manufacturer's page. Cut out a piece of cardboard and put it on your frame to get an impression how it will fit. Don't forget about the bottles! 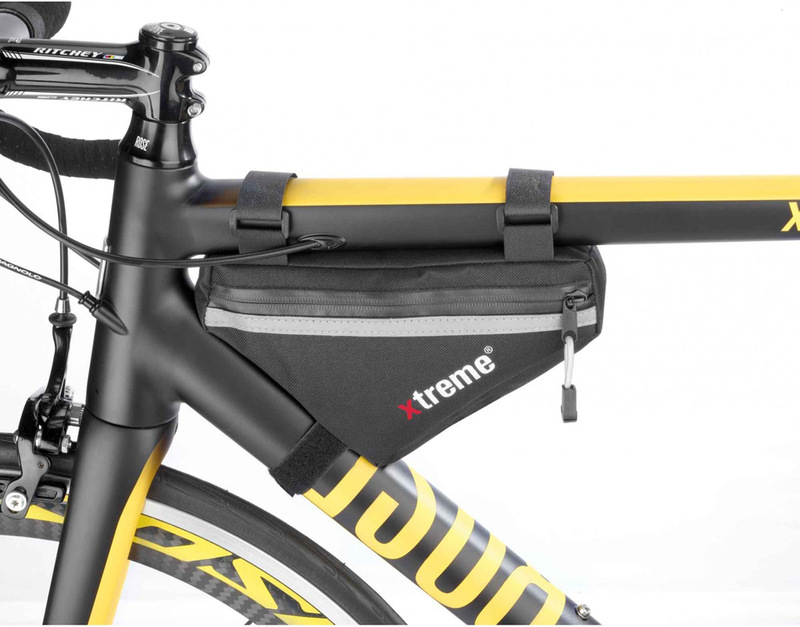 Consider the position of the straps on the bag and the cable stops/guides on your frame. When in doubt, contact the manufacturer with your frame dimensions. Brands are in alphabetical order. Highest figures are in bold (does not imply better). Calculated values are my own, but are probably on the high end as the bags are not perfectly triangular. Prices are as found at various large online retailers in early 2014 and are rounded up. Prices with asterisk are converted from another currency to euro. 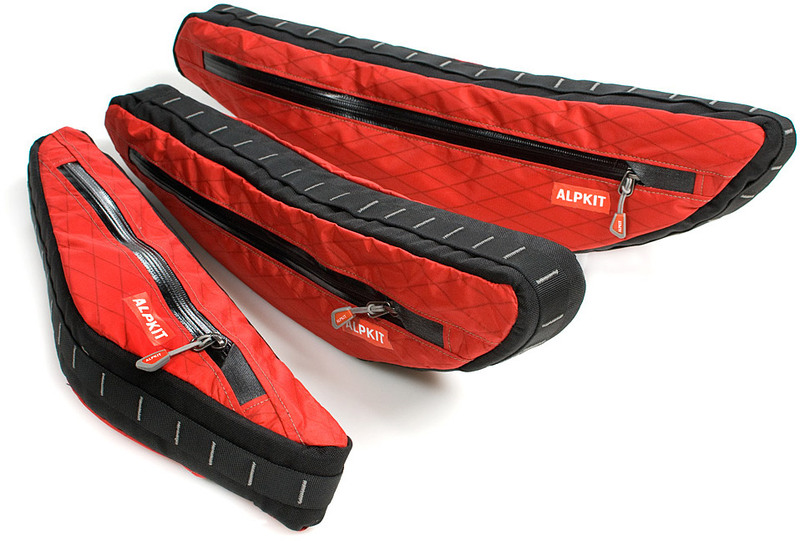 Alpkit manufactures their bags in the United Kingdom and sells them directly to consumers. The Possum is available in black, red, orange, yellow and gray, with other color options on request. The material and zippers are water resistant, though the seams are not. Alpkit provided me with approximate volumes on request. 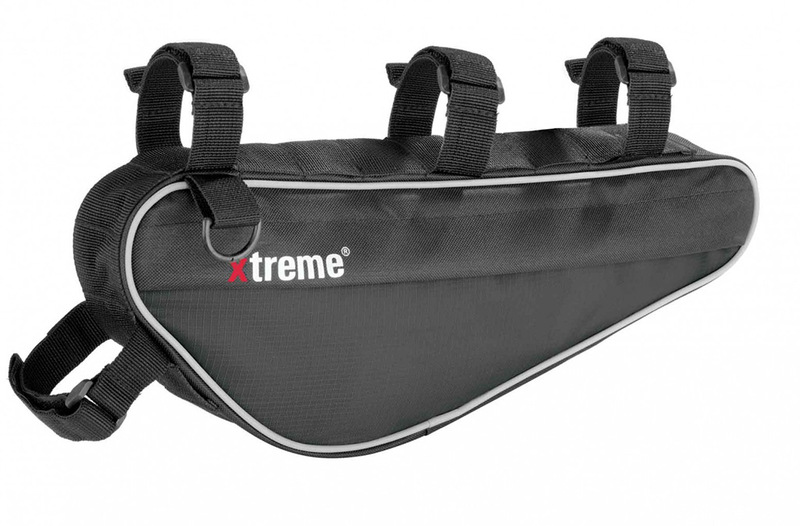 A "webbing ladder", which runs along the top and bottom, allows you to secure the velcro straps at any point on the bag. This way you can avoid the cable stops on the frame. You can easily replace the velcro straps when the velcro wears out over time. 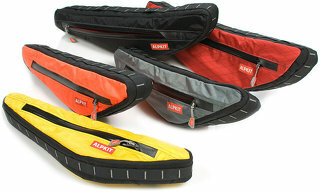 The Alpkit Possum comes in 3 sizes and 5 different color options. 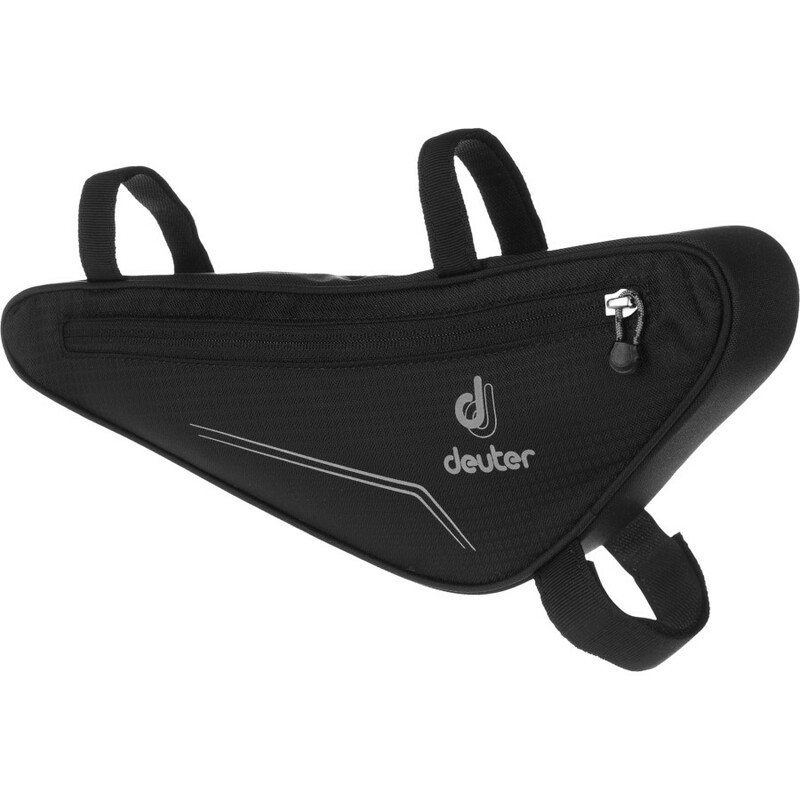 The Deuter Front Triangle Bag is very fairly priced, but has a reasonable small amount of storage capacity. At 130 grams it is also quite light. Jandd makes a front triangle bag that comes in seven different colors. They also have a large version that is only available in black. It goes all the way to the seat tube if your frame has the right size. Both are quite affordable for the storage capacity they provide. The bags are quite narrow, much of the volume comes from the fact that they are higher than all other bags, this leaves less space for bottles inside the frame. The zipper has a flap over it, but according to the manufacturer, it provides "easy access on the fly". Revelate Designs is a company that makes bike packing bags and sells them directly to consumers. They make bags for bicycle manufacturers Salsa and Surly. They are based in Alaska, USA but ship worldwide. These are the biggest bags in this comparison. This is partly because these are so-called half frame bags; they run all the way from the front to the back of the front triangle. 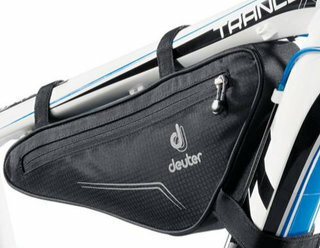 This means that choosing the right bag depends very much on your frame size. You have to be careful not to get one that is too big. 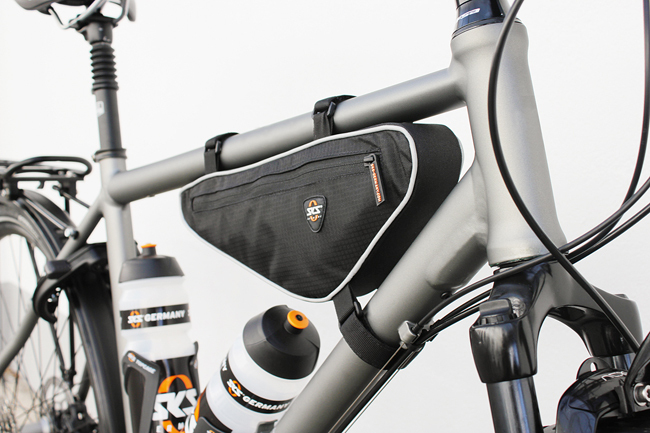 The Tangle Frame Bag goes from the front all the way to the back. The bags come in the colors black, red, slate (dark gray) and digital camo. Approximate weight and width were provided on request. After making this comparison I decided that this bag would suit my needs best. 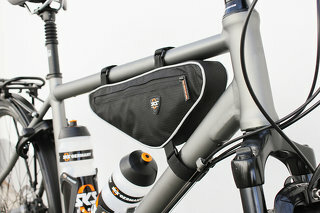 Read my Tangle Frame Bag review for more information. 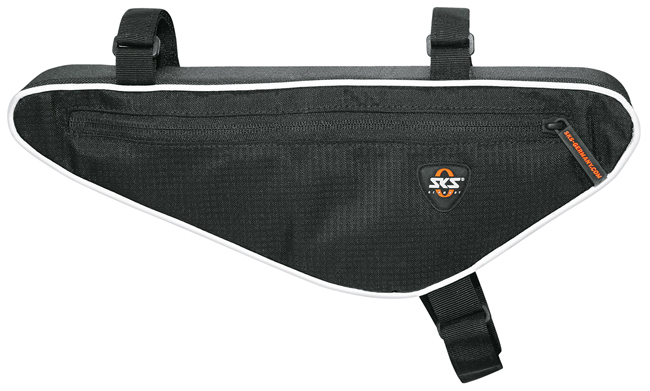 The SKS Front Triangle Bag has a similar name, dimensions and price as the Deuter bag. They both seem to be good value for the money. The dimensions provided by SKS are a little smaller, but Deuter has a habit of rounding up their numbers. The SKS bag still leaves space for bottles. 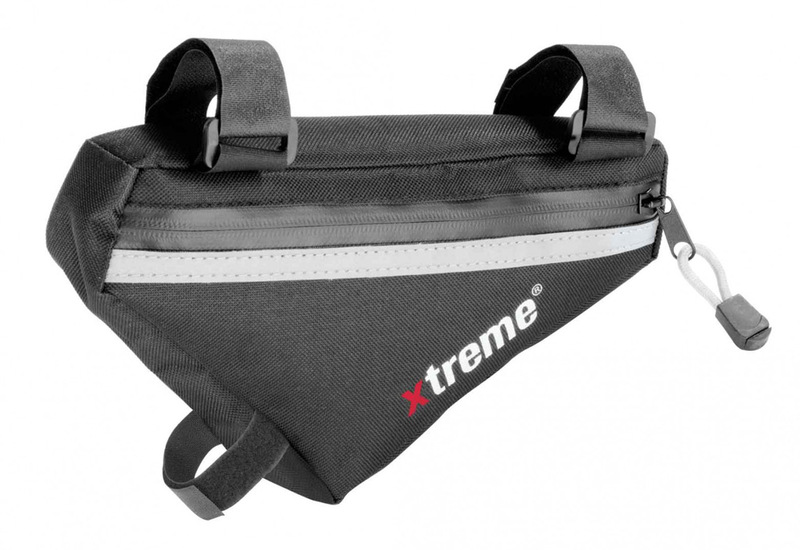 Xtreme is a brand that is sold by the Rose online shop that sells cycling products throughout Europe. The Easybag has two versions; small and extra large. They are the cheapest front triangle bags I could find. The zipper of the extra large version is covered by a flap. Most likely to keep water out as the zipper is probably not very water resistant. This flap may make it harder to access the contents of the bag while riding. The large version has a webbing ladder like the Alpkit Possum which allows some flexibility with the placement of the straps. A small bag leaves more room for bottles. The large version might obstruct the bottle on the down tube of this frame. Apidura is a new manufacturer of bikepacking gear from the United Kingdome. 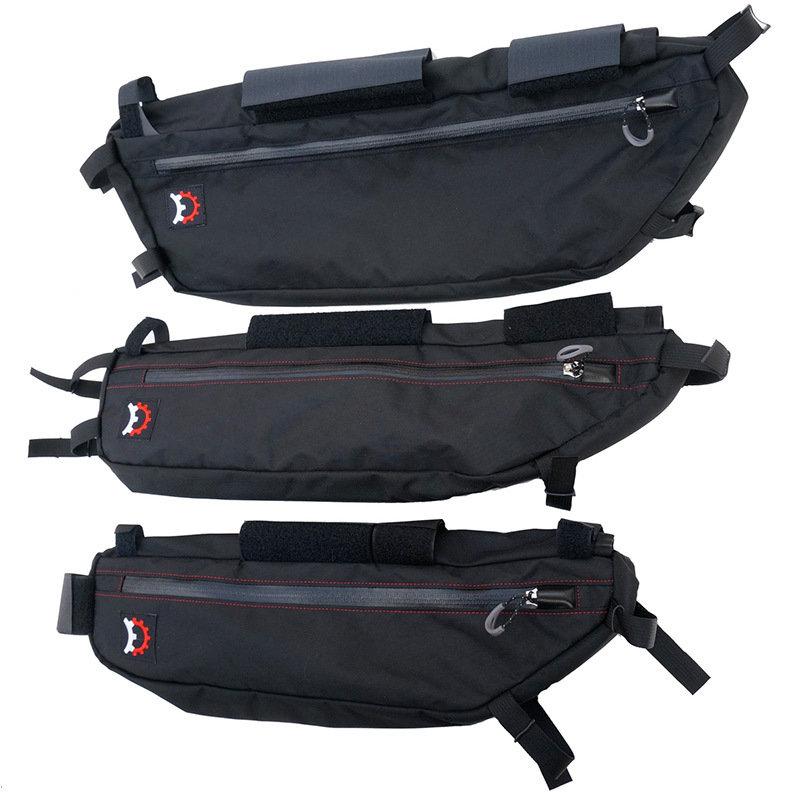 They have three front triangle bags, but at the time of writing they are not yet for sale. 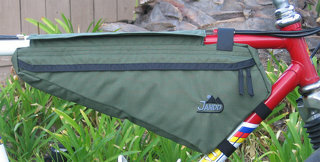 J.Paks LLC J.Paks LLC is a manufacturer in Colorado, USA which makes custom frame bags. Including a full and half frame bag. Did you like this article? 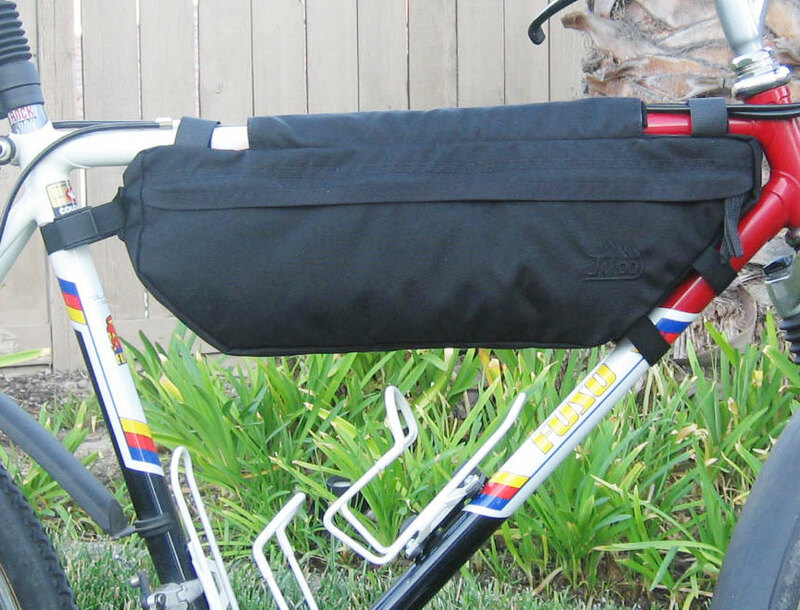 The you might also enjoy my comparison of top tube bags. If you did not like this article and have any suggestions for additions or corrections to this article please contact me.